Beneath the Rowan Tree: Valentine's to Share! Seasonal parties can be a challenge for families with kids who have food allergies. So many of the little parties children enjoy involve special food treats, even center around them! As Rowan gets older and becomes more aware of what she cannot have, it becomes tougher to attend these gatherings and keep a happy child. At home,things are pretty smooth, and when we grocery shop she often points out foods (like cheese and eggs) that are 'for daddy, not us' (I also have a dairy allergy) ~ and so far being an 'us' keeps her happy. 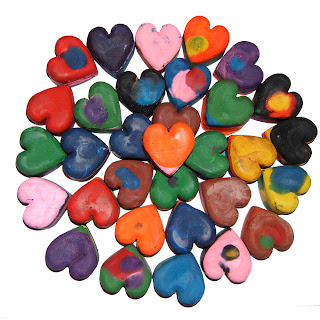 With Valentine's Day coming up, we are making lots of heart shaped crayons to share (and t o sell for others to share!). We are also having fun with our new product ~ the Art Pop! 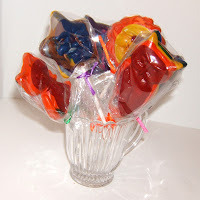 Art Pops are crayons on a stick, just like lollipops but without the sugar. A great favour for parties and events where a non-food option is desired. More information about these items can be found on our website, and listings for these items (packaged and personalized!) can be found at Etsy, Hyena Cart or by dropping us a line. We plan on taking hearts to our local drop in for Valentine's Day!